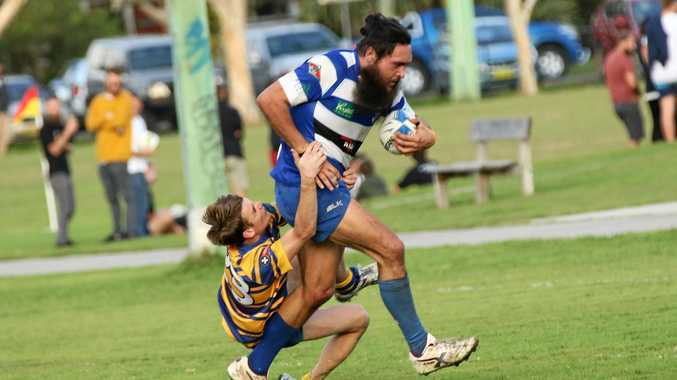 BYRON BAY has beefed up in size with the return of man mountain Will Aisake when it plays Casino in Far North Coast rugby union at the Byron Bay Recreation Ground today. The popular second-rower is an imposing figure on the field with his height and has plenty of weight behind him at set pieces. He comes back to a new-look Byron Bay, having captained the team in his final game last year before heading to Europe in May. "It was a bit of a shock to see him back,” Byron Bay coach Jeff Watt said. "We thought it would be more of an 18-month or two-year type thing but we're delighted to have him back. Byron Bay has had a slow start to the season and felt the pinch when they travelled to Grafton with only 17 players in a 43-8 loss last Saturday. Flanker Craig Wallace was forced into the front row while fullback Jascha Saeck moved into halfback where he struggled. "Last week was a bit of a disaster and some of our European boys found it really tough in the heat,” Watt said. They have seven new players in the starting side including flanker Keith Strajnar and No8 Cooper Lau. "They're a couple of builders who have moved to the area and they have plenty of work to keep them here, by all reports,” Watt said. "Both of them are Aussies and we've lost a lot of our internationals who were here on two-year visas. Elsewhere, five-eighth Hugo Marks returns for Lennox Head when they take on Southern Cross University at Maurie Ryan Oval, Lismore. Gold Rats front-rower Jake Creagh has moved to No 8 and will play against his former club for the first time. 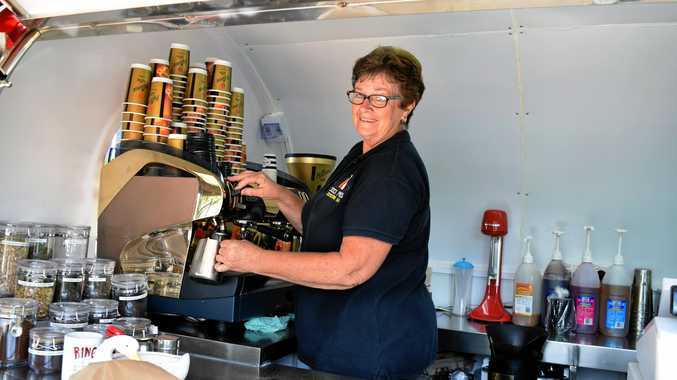 In other games, Ballina plays Lismore City at Quays Reserve, Ballina; Casuarina hosts Bangalow; and Wollongbar-Alstoville will be at home to the Grafton Redmen at Lyle Park. Byron Bay: 1 James Starkey, 2 Andrew Teuma, 3 Jordan Elliott, 4 Will Aisake, 5 Phil Hall, 6 Keith Strajnar, 7 Craig Wallace (c), 8 Cooper Lau, 9 Blake Whittakar, 10 Pete Gillespie, 11 James Boozer, 12 Owain Roberts, 13 Romey Vassell, 14 Kristian Avotins, 15 Jascha Saeck. Coach: Jeff Watt. Casino: 1 Craig Connolly, 2 Ben Collison, 3 Scott Kenny, 4 Callum McLennan, 5 Nathan Davy, 6 Theo Van De Merwe, 7 Elliott Birmingham, , 8 Marcus Cusack, 9 Stephen Murchie (c), 10 Nick Armstrong, 11 Nick Benn, 12 Sililo Stavenow, 13 Carl Tahatu, 14 Jordan Lynes, 15 Harrison Cusack. Coach: Doug Murray. Southern Cross University: 1 Pat Kelly, 2 Isaac Penfold, 3 Mitchell Bird, 4 Brad Sneath, 5 Murray Wade, 6 Matt Anderson (c), 7 Michael McMullen, 8 Jake Creagh, 9 Will Hawkins, 10 Kirk Taylor-Brown, 11 Riley Spencer, 12 Matt Murray, 13 Steve Spinks, 14 Josh Wilson, 15 Matt McMullen. Coach: Harry Witt. Lennox Head: 1 Angus Langfield, 2 John Young, 3 Jacob Carter, 4 S Dwyer, 5 Luke Smith, 6 Jackson Gardnir, 7 Jack Tyndall, 8 Hayden Blair (c), 9 Abe Goldsmith, 10 Hugo Marks, 11 Cooper Wilson, 12 Jack Norman, 13 Callum S Jones, 14 Toby Creagh, 15 Martin McNamara. Coach: Paul Fish. Ballina: 1 Isaac Pratten, 2 Siaosi Ofalanga, 3 Callum Turner, 4 Jakob O'Connor, 5 Marcus Lees, 6 Luke Kliese, 7 Brad Brown (c), 8 Stan Lolohea, 9 Nick Watson, 10 Grant Knight, 11 Terry Ferguson, 12 Ant Lolohea, 13 Siosuia Koloto, 14 Romulo Leweniqila, 15 Tom Watson. Coach: Andrew Fraser. Lismore: 1 Jathan Von Bratt, 2 Cody Johnston, 3 Marcus Ellison, 4 Ben Carroll, 5 Jed Lisetto, 6 Tyler Coveney, 7 Brenden Williams (c), 8 TBA, 9 William Fairweather, 10 James Grubb, 11 Toby Wongkruth, 12 TBA, 13 Sam Johnston 14 Jake Lennon, 15 Andrew Sky. Coach: Ray Taylor. Casuarina Beach: 1 Robert Beacroft, 2 Dan Heritage (c), 3 Bruce Somerville, 4 Elisio Tagidrau, 5 Chris Dowling, 6 Winiata Barrett, 7 Chris Luxton (c), 8 Mitch Planten, 9 Webb Lillis, 10 Rian Olivier, 11 Josh Harman, 12 Michael Coates, 13 Kai George, 14 Seb Lamilla, 15 Richard White. Coach: Mick Hall. Bangalow: 1 Neil Moran, 2 Lachlan Baynham, 3 Dan Hill, 4 Angus Dickson, 5 Rob Wightman, 6 John Turagabeci, 7 Josh Johns, 8 Jock Craigie (c), 9 Rowan Ozols, 10 Kye Spence, 11 Jack Bensley, 12 Aniri Whewell, 13 Alex Wadsworth, 14 Sam Campbell, 15 TBA. Coach: Tim Cohen. Wollongbar-Alstonville: 1 Benji Tiatia, 2 Bill Johnston, 3 Matt Wright, 4 Zak Galbraith, 5 Josh Galbraith, 6 Austin Markwort, 7 Hamish Mould, 8 Nick Pennisi, 9 Louis Hollman, 10 Ben Damen (c), 11 Lachlan Thompson, 12 Daniel Damen, 13 Josh Damen, 14 James Vidler, 15 Sam Kerry. Coach: Paul Jeffery. Grafton: 1 Jordan Walker, 2 Zac Mason-Gale, 3 Dan Blackman, 4 Guy Robertson, 5 Jack Anderson, 6 Billy Whalan, 7 Tom Tanner, 8 Ed McGrath, 9 Dom Bullock, 10 Adam Smidt, 11 Trevor Walters, 12 Dwayne Duke, 13 Jake Harris, 14 Rhys McDonald, 15 Kyle Hancock (c). Coach: Craig Howe.